Last year, I decided I really wanted to read The Arabian Nights. As I always do with foreign classics, I started researching translations, and it wasn’t long before I realised that Husain Haddawy’s translation was definitely the one for me. So I popped over to my library website, and discovered that they favoured Richard Burton. :/ I was on a no-book-buying ban (which I still am), so Arabian Nights would have to wait. Flash forward to February, when I won a drawing for Dewey Decimal Challenge participants and got to pick a book from Amazon. I plumped for The Arabian Nights. But old books scare me. When I had been doing my translation research, I came across Robert Irwin’s The Arabian Nights: a Companion, which my library thankfully carried. So last month I finally got that out of the library, saw that Rebecca had the same translation from her library, and proposed a read-a-long. Then I proceeded to not open either book until yesterday. Sorry if all of that was too much introduction! Anyway, Rebecca posted her early thoughts yesterday, and I suddenly remember that I was supposed to be reading along! lol I started with the Companion, which quite impressed me. The introduction was accessible, the first chapter gave a history and evaluation of Western translations and the second explored the origins of The Arabian Nights itself. At that point, I was raring to crack open the actual text. But of course, I had to read Haddawy’s introduction (there is a good history of the translations in it, which I skipped for obvious reasons, but if you’re not reading the Companion, this is one case where I’d highly recommend reading the introduction before the read the work), which confirmed my choice of translator! Oh yeah…I bet you guys want to hear about the actual stories! Well, I was surprised at how readable it is. I usually read books in 50 page chunks, and while I stuck to that on the first go-round, during my second reading I raced through 80 pages before I would set it down! The stories themselves are always short, but since they lead one into the next, I can follow it without any effort. This isn’t a book about character development, or fancy dialogue, it pretty much rests completely on plot. For some reason, though, this works for me! I’m curious to see what the demon’s going to do next, or how the prince is going to get out of the sticky situation, or why the girl is beating the two black dogs. Rebecca is having a different experience reading it, so definitely go read her thoughts as well, but as for me, it’s a 10 out of 10 on the readability scale. That being said, there are things that bother me about it. Perhaps I should, there’s one huge thing that bothers me. The way women are portrayed. They’re almost always cheating on their poor, innocent husbands (usually with a black slave…which seems to reveal a whole different paranoia on the authors’ part), there have been several witches, and even the ‘virtuous’ ones die in horrible ways with barely a moment of silence from the heroes. Almost every story centers around male characters. 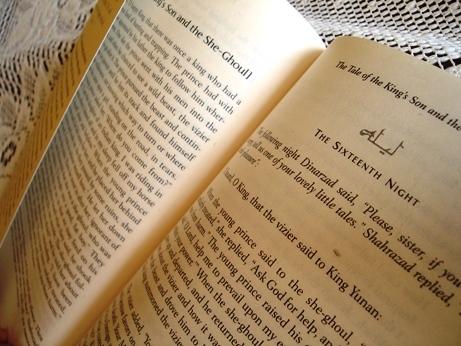 In fact, the very first story in the book (which Shahrazad’s father tells her while trying to convince her not to go to the crazy homicidal king) is about a man learns to beat his wife from his animals, after which they all live happily ever after. I almost stopped reading. However, that’s the worst story I’ve read so far in terms of misogyny. And I’ve been able to remember that these stories are from the Middle Ages, and that traditional European fairy tales are also ridiculous, so I mainly rejoice in being a twenty-first century woman. The thing that fascinates me the most so far is the mixture of Islam and devils/jinns/witches/etc. But really, I’m just having a ton of fun reading the stories! The Companion is really helpful in providing historical and cultural context (although the third chapter, which was all about where the stories might have come from-India, Persia, etc.-I found quite dully, the other ones have made up for it); it makes for a richer reading. That being said, I’ve fallen in love with Shahrazad’s tales, and I highly recommend that if you want to read The Arabian Nights, you go for this edition. Husain is a marvelous translator, and Norton has outdone themselves in the publication process! I have a question for you: Have you read any of The Arabian Nights? Which translation did you use, and what did you think of it? Or what old books in general did you find surprisingly readable? I’m really glad it is an easy read for you! I don’t know why but I can’t sit and read it straight. It starts to bother me. Maybe it’s the abuse of women as you say, but I don’t know. It’s just harder for me. I found The Iliad and the Odyssey to be easier to breeze through last year. Those, to me, were surprisingly readable. I’m glad you’re having a good time with this – I have been toying with the idea of reading this, because I’ve seen a lot of references to it lately (or how it influenced the modern novel or mystery story, or really anything to do with literature! ;) ), but then I got scared when I read Rebecca’s review… I get scared of old books, mostly because they’re so long! I think something new I’m going to try is to read these intimidating reads alongside more approachable books, much like I’m doing with Claire for our 2666 read-along! Normally I just read one book at a time, but I think with long books (500+ pages) there’s the possibility I might get bored, especially because I spend so much time with them. But perhaps by committing to reading 100 pages a week or so, I could finally tackle some of the books that scare me but in a way I find manageable! Arabian Nights was on the list of 1001 books to read before you die. I got it from the library but never got around to it. I might get the edition you did. It sounds magical! Steph, keep in mind that my post was just an in-progress ramble not a review-in-hindsight. I still have a lot to go! And I am enjoying it, just taking forever! I’ve read a few, mostly ones about Sindbad but I’ve no idea what the translation was. I’ve heard that most modern Muslims do not approve of The Arabian Nights. As I’ve told Rebecca, I also happen to have recently started “The Arabian Nights”. The edition I have is a Barnes and Noble Classics and is an English version of Antoine Galland’s French translation back in the 1860’s. I was misled somewhat when I picked up the book because the cover says “Introduction and Notes by Muhsin al-Musawi” so I thought it was a more recent translation. I definitely want to get the version you guys have–I’ll look for it after I return from vacation–meanwhile I’ll read the one I have and then we can all compare!! I adore it (it’s always been One Thousand and One Nights to me). I remember as a child having a book with stories from around the world, I’m guessing it was beautifully illustrated, although I can’t remember that (my minds a large, well-worn sieve) and one of the stories was Aladdin. I was immediately engrossed, the stories are wonderfully evocative and yes, they are misogynistic and a strange, but ultimately fantastic, melange of different cultures, and styles from various countries. It’s still a bloody good read. I hope it’s OK to say that your geekiness is adorable – I so enjoyed the how to explanation of this review before you ever got to the story! And, no, I never realized those tradeback flaps are for book marks? huh. Well now I want to read this. Do you find yourself thinking about modern references to the stories as you’re reading them? Steph, I think that’s a great plan! I’m almost always reading more than one book, and it works really well for me! Claire, Haddawy’s translated came out in 1990. I’m glad you enjoyed this one as well! Ryan, I think Haddawy choice Arabian Nights as the title because the book doesn’t include the full 1,001 nights, just the first 300 or so. Definitely a bloody good read! Care, hehe: of course that’s ok! I embraced my nerdiness a logn time ago. ;) I don’t know if the flaps are really for bookmarks (I don’t rip them off or anything, just use them attached to the cover), but I couldn’t think of the word flaps LOL so I was trying to get it across! Softdrink, well, have you read Umberto Eco’s The Name of the Rose? I’ve read it twice, and I always thought the way the murderer was killing his victims was so awesome and creative on Eco’s part. Then, about twenty nights in, I found the same killing method in these stories! lol Other than that, most of the most popular stories in the West (Sinbad the Sailor, Aladdin) aren’t actually part of the authentic 1,001 nights series. I haven’t read Arabian nights, but when I was young, there used to be this Arabian nights series on Sunday on the telly as a Children’s program. It was a televised version of the book, I think. It was so much fun and I and my sisters used to look forward to it. I’ve always wanted to read the book, may be sometime I will. Hmmmm…..I’ve always wanted to read this. I have to say, you are WAY more thorough than I would have been researching a translation. I’m kind of a fly-by-the-seat-of-my-pants (unfortunately) kind of person and probably would have grabbed the first copy I could get my hands on. Bad, I know. I’m sure I would agree with you on the portrayal of women. That kind of thing makes me a little crazy sometimes. But overall, you seem to be enjoying it. May have to make this a “project” sometime soon! I have never read this, but it’s always sat in the back of my mind as something I’d like to read someday. I’m so glad you’re enjoying it! I’m also glad that you noted the translation. I’m also really picky about translation (when I learned Russian to a level of near-fluency, I realized the importance of a good translation for getting across both the meaning and the feel of the original) so it will be really helpful to see if this one works for you. Violet, I would have loved that TV series as a kid. :D Aladdin was awesome! Stephanie, lol; since I was a modern languages major in college, I secretly wish I could read everything in the original. So researching translations is my way of compensating! Even though women aren’t treated that well, it doesn’t bother me the way it would in contemporary lit. Debi, I was totally intimidated by it too. But it’s so much easier to read than I expected! I’m so glad that you went into detail about which edition you read! The copy I have is the Penguin Classics by Dawood and I do not like it at all. The introduction actually points out that certain things were left out or altered because they serve no literary value. That turned me off quite a bit. Now I will definitely pick up a copy of the Norton translation! Joanne, what a weird introduction! That would annoy me for sure. I loved these stories as a kid, so I don’t know what version I read, but I do know that the character that fascinated me most was Scheherezade herself. Imagine saving your skin night after night just by telling stories! Talk about the power of narrative! And it seemed that for every scheming wife (and there are many) there was a sly servant girl who would pour boiling oil on the robbers hiding in jars, or the savvy sister who listened to the old man (or the bird) & stopped up her ears to rescue her brothers & restore the family reputation. As an adult, reading them to my child, I thought it quite clever of S.–and whoever was responsible for compiling these legends–to continue to drive home the point that women were clever, and could also be supportive, if they were given the chance–and the trust–to prove it(Burton was 19th century, yes? so females still had to earn their chances; nothing was automatic for a woman). But again, this was a children’s version, which admitted to illustrator but not translator, so perhaps some of the larger issues were omitted. It would be interesting to read this version & see if I still felt the same warm feelings toward these tales, having known nothing until this post and its comments about the political repercussions of tales that I had always ranked with Grimm & Andersen & the like. So thank you for opening my eyes. On a similar note to what ds had to say…. I think there’s a slight theme to the narrative and what Scheherezade was trying to do. Telling the stories wasn’t just about saving her head and future heads (although that was a large part of it). After being cheated on, the king and his fragile ego were very shattered which lead him to kill each wife. Through the stories, I felt she was helping him heal. Maybe not in a way we would today, but for the mores of the time she was basically telling him he was the powerful and strong one who could catch his wife cheating and that she was not the type of woman to do so. I downloaded this book online in an idle mood, little realizing what a big, bad surprise was in store for me. With my vague memories of children’s version read years back, I was ill-prepared for the amazingly narrow and misogynistic portrayal of the women in the first few stories I have read so far (including the topmost framing story of the cheating sultanesses). Just like you, I found it very disturbing. One would believe, men were such innocents. I guess, it tells more about the authors’ own shortcomings than the women’s. I will read the book if only to get an adult impression of a book that I considered interesting as a child. At least the storyteller Scheherzade’s positive character will help me through the book..